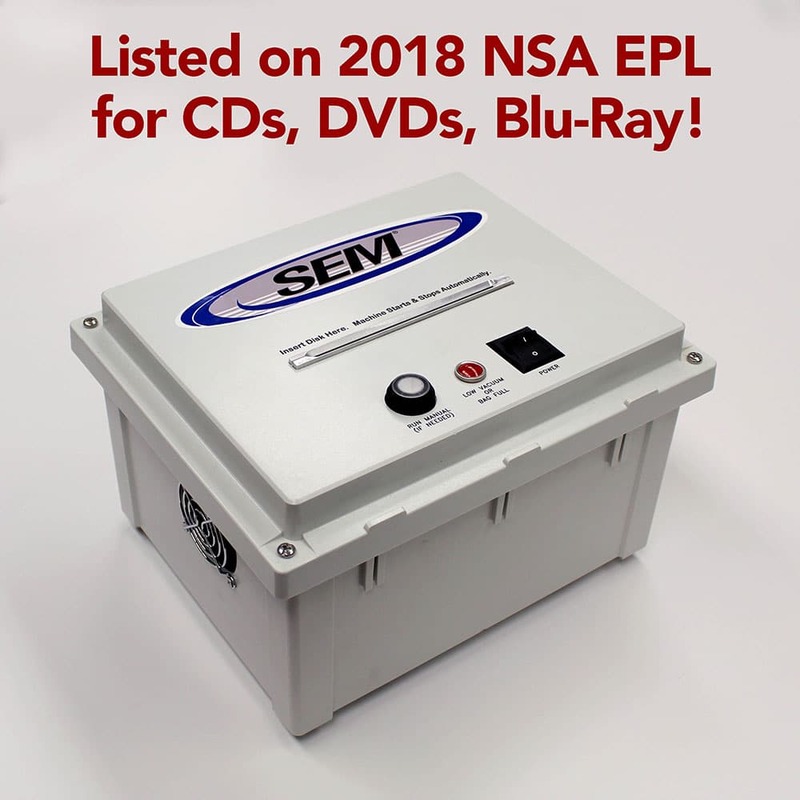 At SEM we frequently hear from customers confused by high security shredder features, ratings, and claims. I’ll flesh out a few of the most common and confusing claims versus some real world facts. Paper Shredder Model XYZ takes up to 18 sheets per feed, or Shredder ABC takes 8-12 sheets per feed. The sheet capacity ratings for high security paper shredders can be confusing. Clear numerical ratings on throughput are surely needed to properly select a machine, and to compare makes and models against each other. In the early days, some manufacturers and vendors based throughputs on thin European “onion skin” paper. That is not surprising, since Germany has long been the largest source of manufacturing of these types of shredders. This led to ratings that could not be achieved for standard office paper, as in 20 pound bond, 8.5″ x 11″ paper. Other manufacturers based their ratings on typical office paper, which is more accurate, but problematic when comparing with machines rated with thin paper. Over time, most sheet capacity ratings have evolved into a range. The lower figure in the range is true for very thin paper. The higher figure is true for common office paper. If one wants a shredder that reliably takes 10 sheets per feed, the right machine will be rated something like this: 10-14 sheets per feed. There are some shredders advertised as taking “up to X” sheets per feed, i.e. not providing a range. These will normally take about 30% fewer sheets per feed for regular office paper. The very best way to compare the relative throughput of high security paper shredders is to look them up on the National Security Agency’s Evaluated Products List for High Security Crosscut Paper Shredders. Those figures are officially determined by the NSA in live testing. They are the real deal. High Security Paper Shredder Model XYZ accepts staples and paper clips. This claim has been popping up for years in our industry. It is a problematic claim that could lead users to cause catastrophic damage to their shredders. Here is the story: In the early days of high security paper shredders, the cutting heads used to be a stacked type, meaning rows of hundreds of individual circular cutters, aligned along two rotating shafts. These shredders were exceptionally fragile. Staples, paper clips, or even frequent overfeeding and jamming could damage them. These cutting heads could be rebuilt, though typically costing $2,000 to $3,000 for the work. Few vendors, if any, dared to claim or imply that it was okay to feed staples and paper clips, and surely none would cover head damage under the warranty. Almost every currently available high security shredder has a solid cutting head, which has cutting features fashioned right into large metal cylinders. There are no individual cutters to replace, so they can’t be rebuilt. Solid cutting heads are much more durable than the old stacked type cutting heads. A user might get away with feeding metal (staples, clips) for a good while without damage. But, eventually metal items will destroy any solid cutting head. Replacement of solid cutting heads is so expensive that it is pretty much never done. The bottom line is that no high security paper shredder can accept staples and paper clips without risk of devastating and irreparable damage to the machine. Also, no manufacturer or vendor will cover cutting head damage under warranty. High Security Paper Shredder Model ABC also takes CDs and DVDs. This claim is often true, but can also be misleading or misunderstood. Standard high security paper shredders are configured to take paper. If CDs, DVDs, or other hard plastics are fed, they can badly clog or jam the cutting head, potentially even causing heavy damage. This is a periodic problem that our field technicians find at customer sites. There are some machines on the market that have separate feed openings and cutters, one for paper, the other for CDs and DVDs. They are often referred to as “combo” shredders. For these machines, as long as the operator puts only paper in the paper slot and only CDs and DVDs in the optical media slot, all will go well. However, there will be an ever present risk that operators will make a mistake, causing serious problems. Operators need to be well trained and cautious to use this type of machine. In many cases it is smarter and safer to get separate, well labeled machines for paper and optical media. SEM offers both combination shredders and also bundles that combine a paper shredder and an optical media shredder with a baked in discount. A little care is required to fully understand features and ratings, but it is well worth taking the time to do so. Click here to view our line of high security paper shredders.